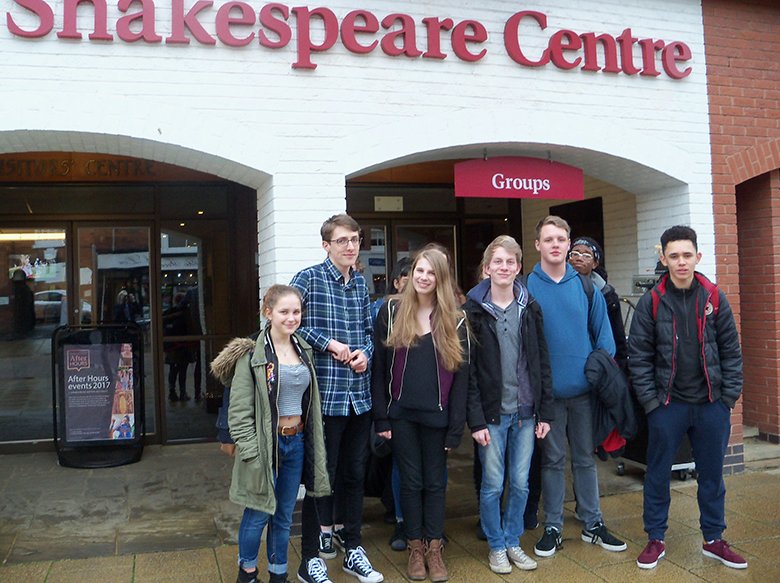 Drama students at The Sixth Form College, Solihull got into the spirit of Shakespearean Comedy last week as they visited the Royal Shakespeare Company and the Shakespeare Birthplace Trust in Stratford-upon-Avon. Students are embarking on their second extract for the assessed performance of their A level Drama & Theatre course in June. The students will research and select from a number of classic Shakespearean comedies, such as ‘The Taming of the Shrew’ and ‘Twelfth Night’. The purpose of the trip was to begin this research with some exciting input from practitioners and historians both at the Royal Shakespeare Company (RSC) and the Shakespeare Birthplace Trust. Students alternated between two experiences: an interactive talk about the comedies of Shakespeare and their background; and a lively RSC workshop tackling speaking and physicalising the text in innovative and amusing ways. The latter ended with a performance of the Mechanicals play ‘Pyramus and Thisbe’ from ‘A Midsummer Night’s Dream’. The Shakespearean comedy is what the students will move onto next, but they are currently working in design teams, designing set and costume and constructing scale models of their sets for their classical set play, the Greek Tragedy ‘Antigone’. They are fortunate enough to use three professionally-equipped studios for rehearsal and staging finished work and get plenty of support from our dedicated and experienced Drama staff, who are always extending students learning with additional trips and workshops to contemporary theatre practitioners.